Kenny Shiels is unable to say when captain Ryan McBride will return from injury. Derry City manager Kenny Shiels could give new signing Maximilian Karner his debut at Bray Wanderers tomorrow night (Kick-Off 7.45 pm). Shiels, who admits he doesn’t know when centre-back pairing, Ryan McBride and Aaron Barry will be fit, watched the Austrian play alongside Cristian Castells in a friendly match against Coleraine on Tuesday night and he was impressed with what he saw. 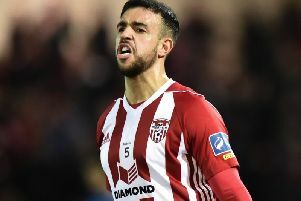 The Derry boss believes his team is coming up against the in-form side in the Premier Division after Wanderers went eight games unbeaten - including impressive victories over league leaders Dundalk and Galway United in their last two outings. Since his appointment in June as new Wanderers manager Harry Kenny has got the ‘Seagulls’ flying up the table. “Harry has done well and has used his contacts by bringing in a lot Shamrock Rovers players and players from that area,” added Shiels. Max and Cristian are both available for selection and we are going to work on that at training. The Derry boss has no new injury problems going into the game. “Aaron and Ryan are going to be out for a while and I can’t say how long, because Aaron has a very inconsistent injury. Sometimes he feels it’s getting better and then it’s not as good as it was and I can’t see them playing this side of September,” he added. Shiels also confirmed that he has offered professional contracts to trio Conor McDermott, Ben Doherty and Rory Holden, while Aaron McEneff has also been offered a contract extension. “Aaron, Conor, Ben and Rory are good young boys and we are working hard to get them signed, they are players for the future for this club,” he stated.